Savings: Prices of £275.56, £233.15, £219.02, £211.85, £207.61, £204.73, £202.66, £201.14, £200.00 and £199.02 are available when you order 1, 2, 3, 4, 5, 6, 7, 8, 9 and 10 items or more of this product. Expanded Polypropylene or EPP is even stronger than EPS and is available to purchase direct from this site in two standard densities (60 & 80 g/ltr). We also have the abilty to produce EPP block in a wider range of densities to suit your requirements. Please call to discuss. EPP is widely used in the automotive industry where it reduces weight and improves vehicle economy, the material exhibits good technical properties and is 100% recyclable. Tolerance values are between 1.7% and 2.2%. Q. Why would you use our Polystyrene Block over other materials? A. When contrasted with other insulating materials expanded polystyrene has the best performance and the lowest thermal insulation U-vales. Q. How well does expanded polystyrene insulate? A. Expanded polystyrene insulation actually exceeds building regulations and can be tailors to your requirements. When used correctly in wall insulation U-Values as low as 0.07W/m²K can be achieved. Q. I have heard EPS (expanded polystyrene) is highly flammable, is that correct? No that is a common misconception and there have been several convictions for deceptive and unfair marketing relating to claims regarding EPS and flammability. 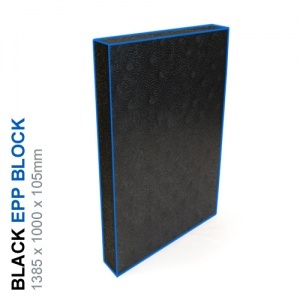 In fact; all our EPS blocks are moulded using flame retardant bead. © 2019 Polystyrene Block is a trading division of DS Smith Foams UK Ltd.